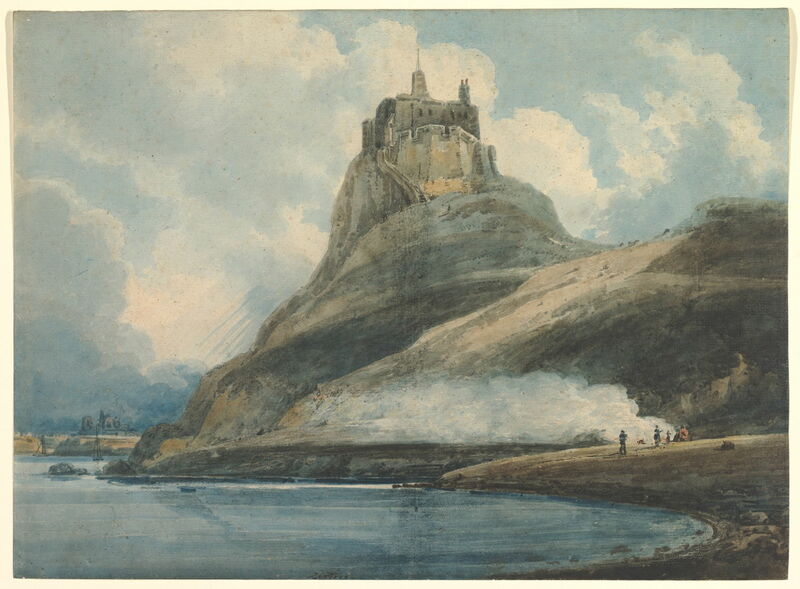 Thomas Girtin (1775–1802), Lindisfarne Castle, Holy Island, Northumberland (1796–97), watercolor, 38.1 × 52 cm, The Metropolitan Museum of Art (Rogers Fund, 1906), New York, NY. Courtesy of The Metropolitan Museum of Art. In this and the next article, I would like to provide some insight into the short but very promising career of Thomas Girtin (1775-1802), a British watercolour painter who was both a friend and rival of JMW Turner. As Girtin died 35 years before John Constable and 49 years before JMW Turner, his achievements were cruelly limited. But Turner recognised how good his friend was when he said about him “Had Tom Girtin lived I should have starved”. Thomas Girtin was born to a prosperous brush maker in Southwark, London, on 18 February 1775 (the same year as JMW Turner’s birth), but his father died when he was three. As a boy, he was given drawing lessons, and he was therefore taken on as an apprentice by Edward Dayes, a watercolour painter of views based in Long Acre, in central London, in the summer of 1789. Such apprenticeships had long been the main route for training as a painter, but in the same year Turner had entered the new, improved version of the Royal Academy Schools – formal training instead of seven long years learning the trade. Thomas Girtin (1775–1802), Eton College from Datchet Road (1790), watercolor with pen and gray ink over graphite with gray wash border on gray, thick, moderately textured, laid, cartridge paper, 36.8 x 48.6 cm, Yale Center for British Art, New Haven, CT. Wikimedia Commons. 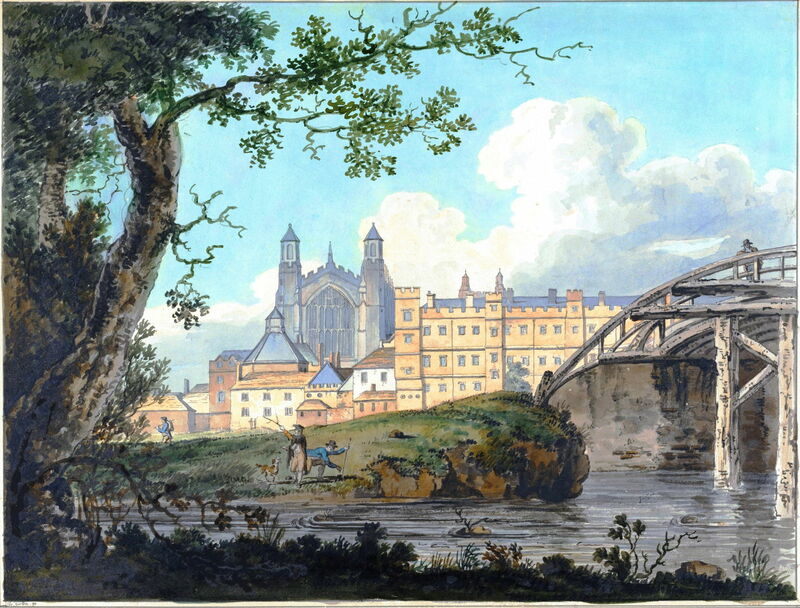 Girtin’s earliest surviving works, such as this view of Eton College from Datchet Road (1790), are impressive for someone less than two years into their apprenticeship, if illustrative in style and a bit wonky in perspective. Thomas Girtin (1775–1802), Rochester, Kent: from the North (c 1790), watercolor with pen and black ink over graphite on beige, thick, moderately textured, cartridge paper, 31.8 x 46.4 cm, Yale Center for British Art, New Haven, CT. Wikimedia Commons. 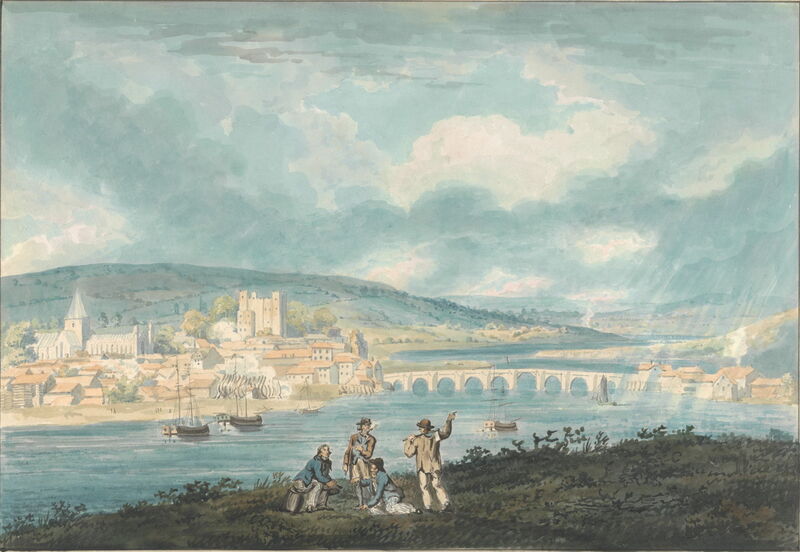 He soon started showing even greater promise, as in the fine sky and effective aerial perspective in his Rochester, Kent: from the North (c 1790), although some have argued that this dates from a couple of years later. 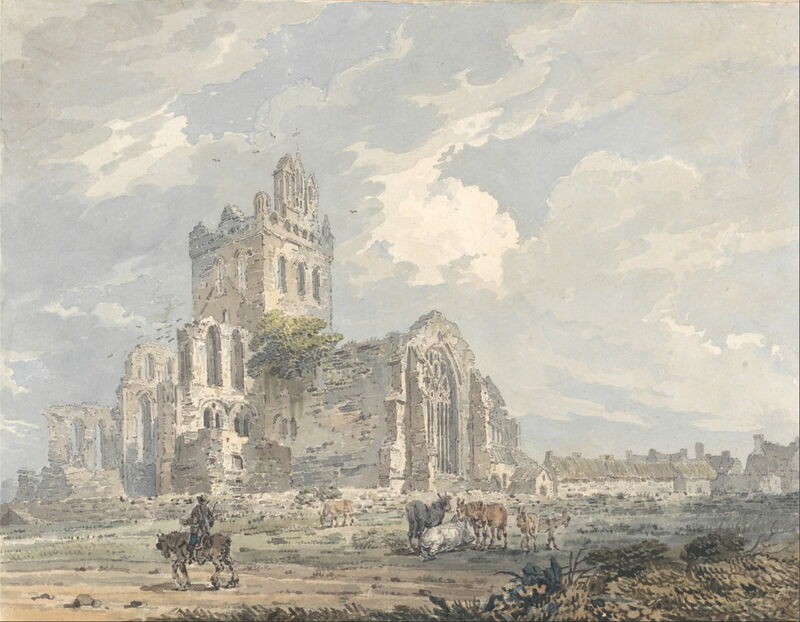 Thomas Girtin (1775–1802), Kirkstall Abbey from the N.W. (c 1792), watercolor with pen in black, gray and brown ink over graphite,with gray wash on mount on medium, slightly textured, beige, wove paper, mounted on moderately thick, slightly textured, beige, wove paper, 24.8 x 29.8 cm, Yale Center for British Art, New Haven, CT. Wikimedia Commons. Girtin probably terminated his apprenticeship as early as 1792, by which time engravings of his work were being published in Copper Plate Magazine. His technique adjusted to facilitate the making of prints from his topographical views, as shown in his Kirkstall Abbey from the N.W. (c 1792). Thomas Girtin (1775–1802), Findlater Castle, Banff (1792-1793), watercolor and scratching out, over graphite on medium, slightly textured, wove paper, mounted on thick, slightly textured, beige, wove mount paper, 24.8 x 29.7 cm, Yale Center for British Art, New Haven, CT. Wikimedia Commons. By 1793, he was working for the antiquarian James Moore. 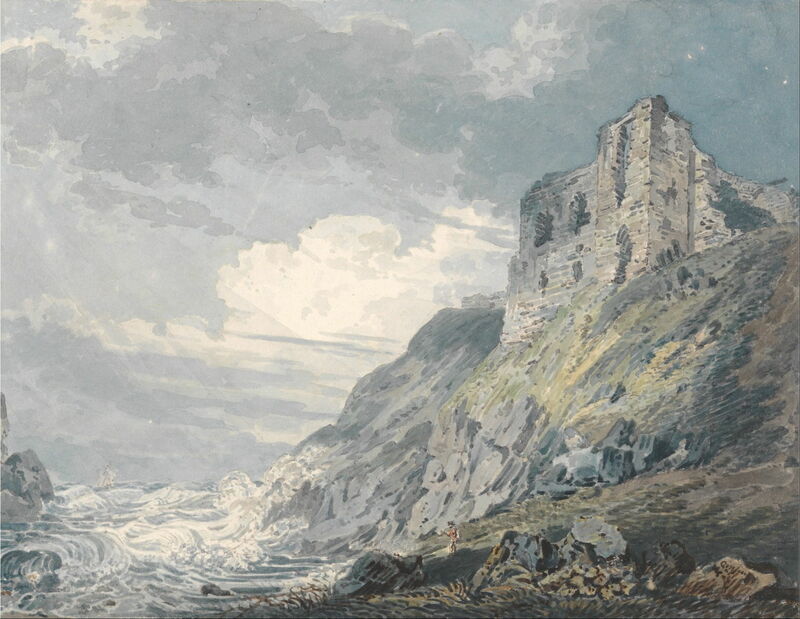 He was taking on more challenging landscapes, including the rugged Findlater Castle, Banff (1792-3). His spirited sea is impressive for someone with such limited experience of coastal views. Most of these earlier paintings were not made in front of the motif, or even from his own drawings made from the motif, but from drawings and engravings by other artists, including Dayes. Thomas Girtin (1775–1802), Dumbarton Rock and Castle (c 1793), watercolor with pen in black ink with scraping over graphite on thick, slightly textured, beige, wove mount paper, 22.4 x 29.8 cm, Yale Center for British Art, New Haven, CT. Wikimedia Commons. Here he appears to have been experimenting with techniques of depicting water, and of the roughness of Dumbarton Rock itself, using visible brushtrokes and patches of colour. He gradually used less ink, here confining it to foreground detail. 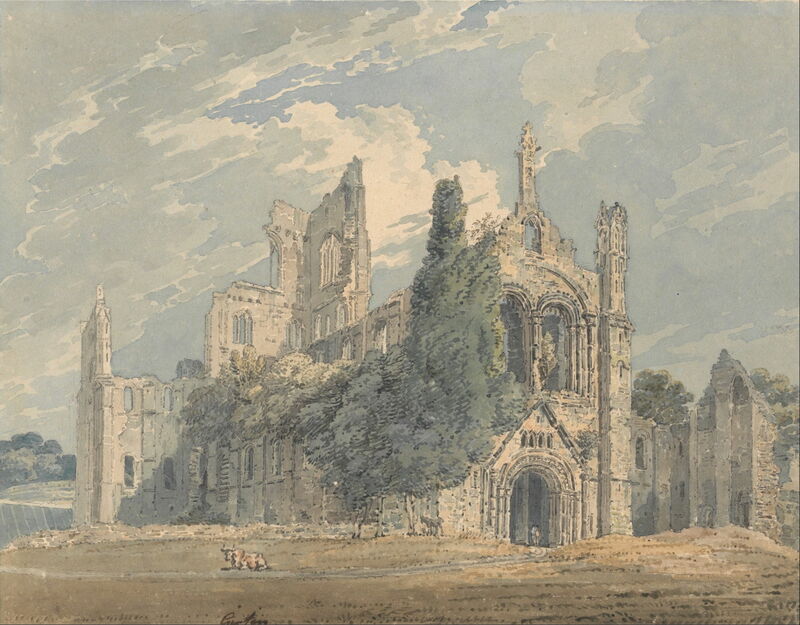 Thomas Girtin (1775–1802), Lichfield Cathedral, Staffordshire (1794), watercolor with pen in gray ink over graphite on moderately thick, moderatetly textured, brown, wove paper, 38.3 x 28.9 cm, Yale Center for British Art, New Haven, CT. Wikimedia Commons. Although he had possibly travelled to paint earlier, his first major painting tour with James Moore was of the Midlands in 1794. 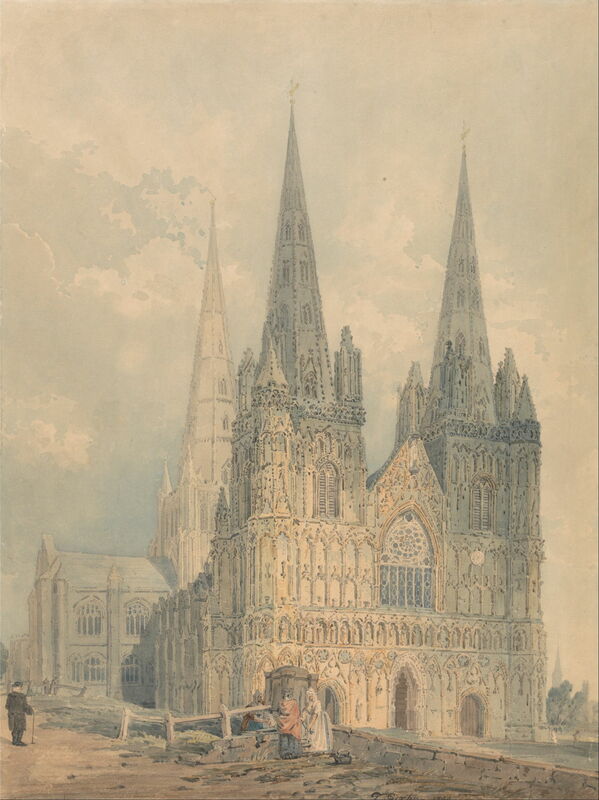 They visited Warwick, Stratford, Lichfield, Peterborough, and Lincoln; this fine view of Lichfield Cathedral (1794) was one of its successes, and already secured him a place alongside the better watercolour landscape painters of the day. In the same year he had his first painting accepted by the Royal Academy, a view of Ely Cathedral now in the Ashmolean Museum in Oxford. 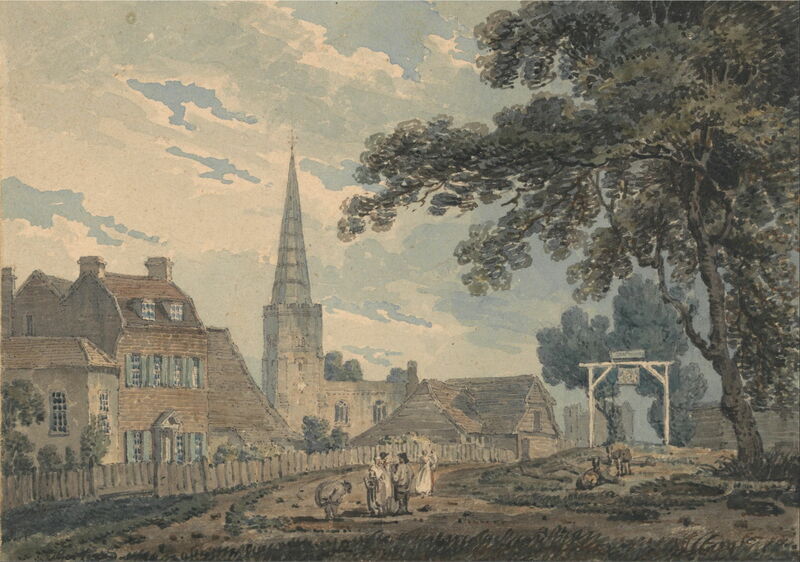 Thomas Girtin (1775–1802), Harrow-on-the-Hill, Middlesex (c 1794), watercolor with pen in black ink over graphite on mounted on, moderately thick, moderately textured, beige, wove paper, 14 x 19.1 cm, Yale Center for British Art, New Haven, CT. Wikimedia Commons. Later in 1794, Girtin started to attend instruction in the home of Thomas Monro, along with the young JMW Turner, where the two became friends and of great mutual influence. Thomas Girtin (1775–1802), Glasgow Cathedral (1794-1795), watercolor with pen in brown and black ink over graphite on moderately thick, slightly textured, cream, wove paper mount, 29.8 x 24.9 cm, Yale Center for British Art, New Haven, CT. Wikimedia Commons. Girtin’s skills of composition were well in advance of his experience and time. 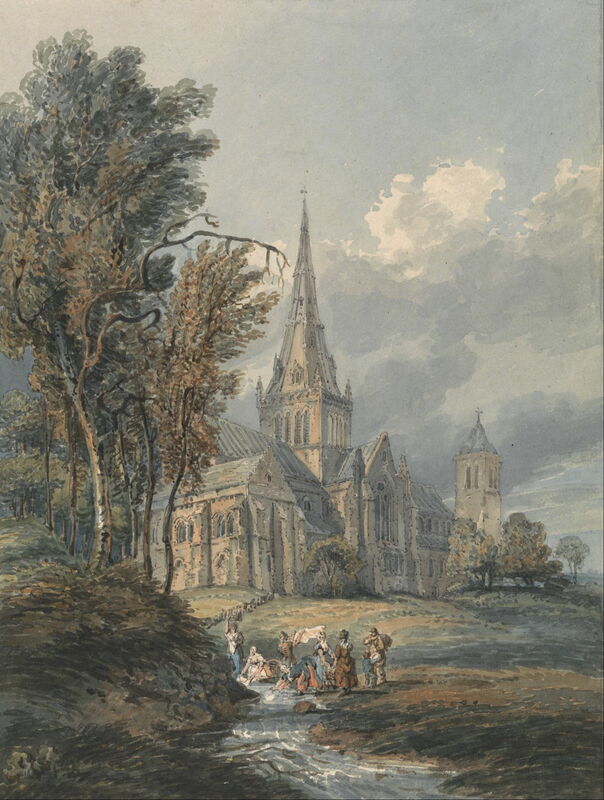 This view of Glasgow Cathedral (1794-5) has similarities to some of Constable’s studies of Salisbury Cathedral from around 1830, such as that shown below. 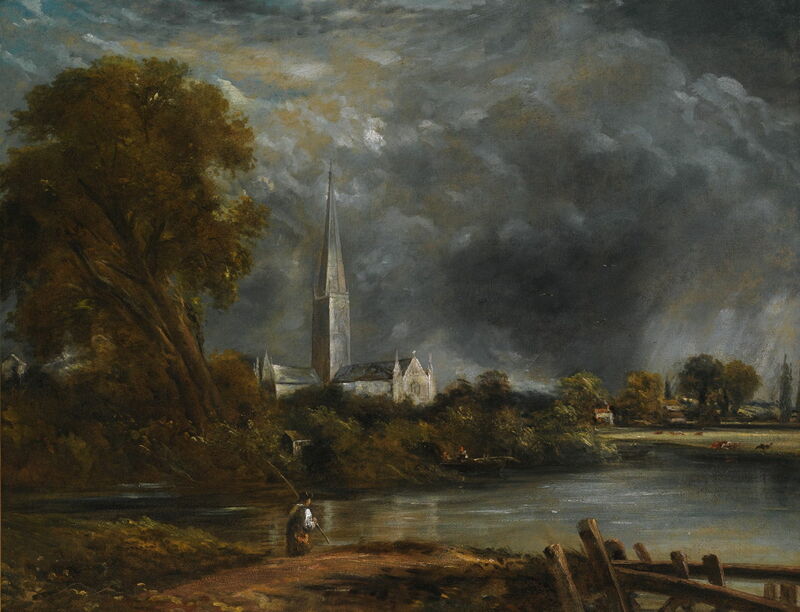 John Constable (1776–1837), Study for Salisbury Cathedral from the Meadows (1830-1), oil on canvas, 71 × 90 cm, Private collection. Wikimedia Commons. Thomas Girtin (1775–1802), Lincoln Cathedral (c 1795), watercolor with pen in black ink over graphite white gouache on mounted on, moerately thick, moderately textured, beige, laid paper, 23.7 x 28.9 cm, Yale Center for British Art, New Haven, CT. Wikimedia Commons. 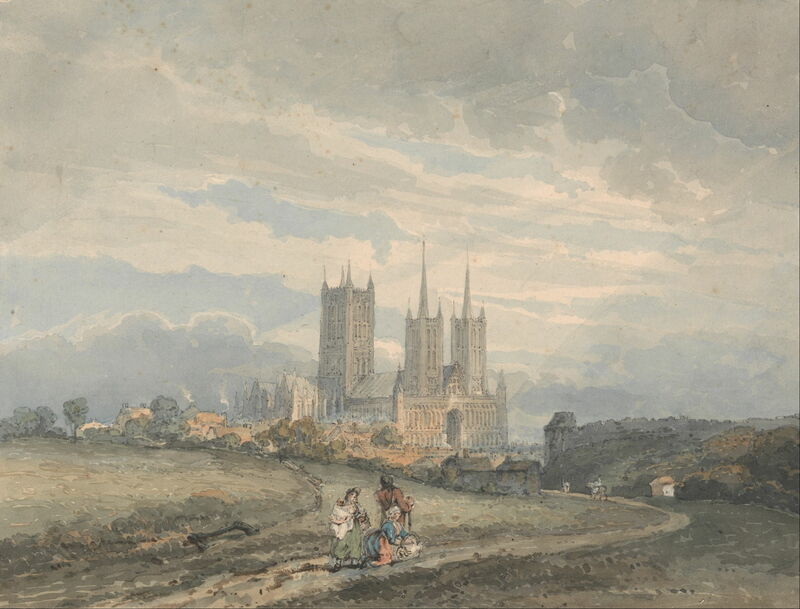 Girtin’s Lincoln Cathedral (c 1795) shows the last vestiges of ink and an illustrative approach fading, and his pure watercolour starting to flourish. In 1795, his major painting tour was to Sussex, in company with his employer, James Moore. 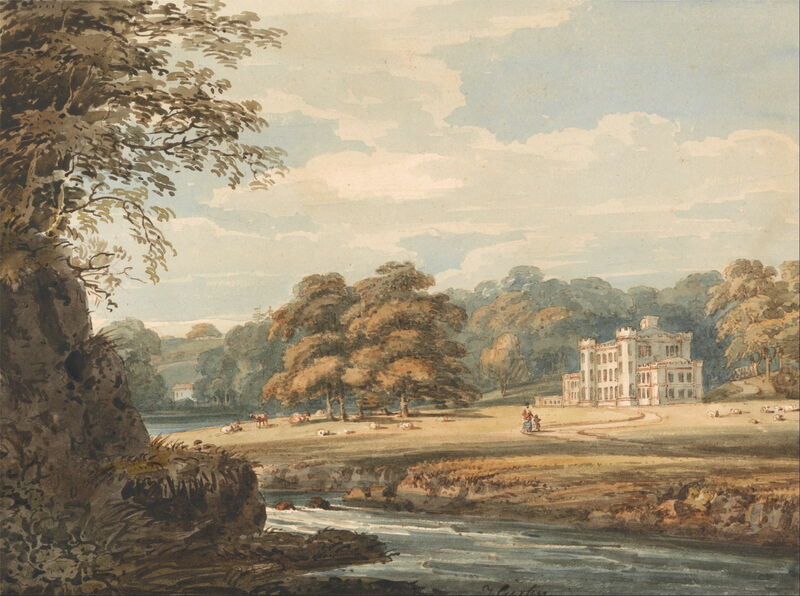 Thomas Girtin (1775–1802), Chalfont House, Buckinghamshire (c 1796), watercolor, 25.9 x 32.2 cm, Yale Center for British Art, New Haven, CT. Wikimedia Commons. In the late summer of 1796, Girtin toured independently for the first time, travelling in the north of England and into the Scottish borders. Among many sketches made during this trip were those for the next painting of Holy Island. Holy Island and Lindisfarne are spectacular and evocative locations on the north-east coast of England, steeped in history, wild and mysterious. Connected to the mainland via a tidal causeway, Girtin would have had little time there to attempt painting en plein air even if he had wanted to, so painting this back in his studio he would have been reliant on the sketches, notes, and memories of the previous year. 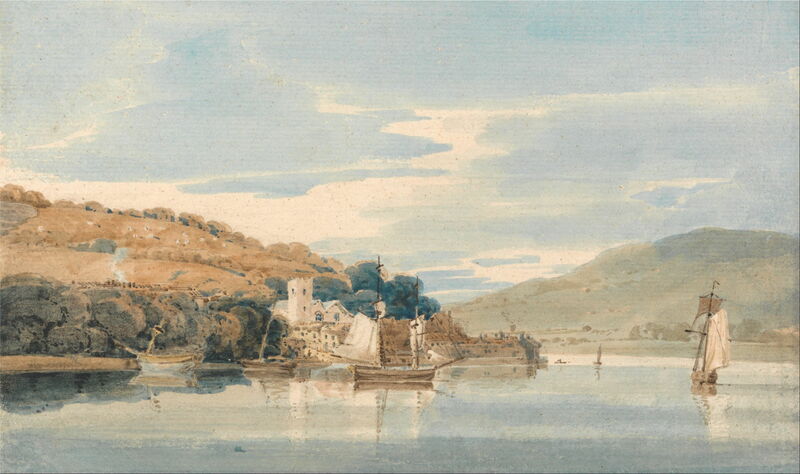 Thomas Girtin (1775–1802), Kingswear Seen from Dartmouth, Devon (c 1797), watercolor with pen in brown ink over graphite on medium, moderately textured, beige, laid paper, 19.4 x 32.5 cm, Yale Center for British Art, New Haven, CT. Wikimedia Commons. 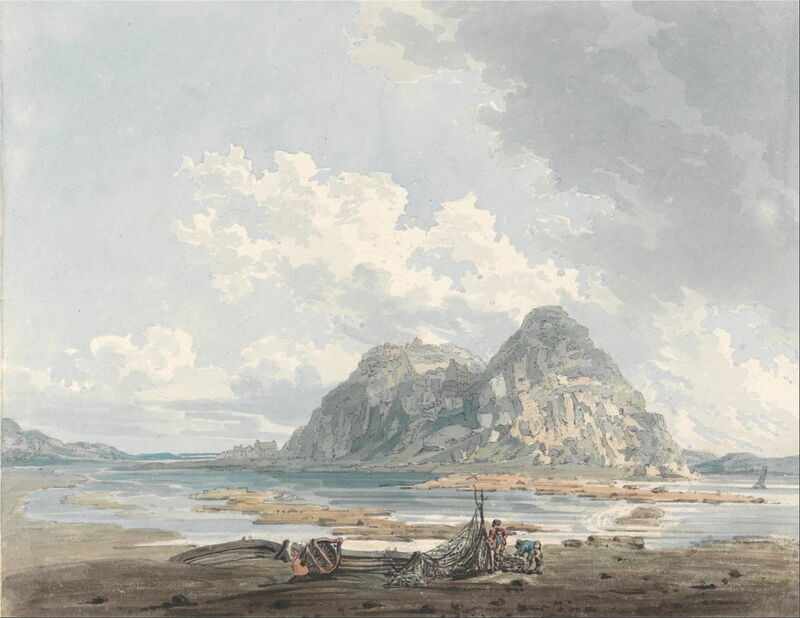 In 1797, Girtin had ten watercolours accepted for exhibition at the Royal Academy, made from his sketches during his northern tour the previous year. These generated his first newspaper reviews, and he was now able to charge significant amounts for commissions, and to enjoy growing patronage. That year he painted in Devon and Dorset, including this beautifully informal view of Kingswear Seen from Dartmouth, Devon (c 1797). His career had got off to an excellent start. In a very few years he had developed the technical skills to compete with the best watercolour painters of the day, including Turner, another rising star. He enjoyed good patronage, although he preferred not to have to cultivate it, but to sell through dealers when possible. The next and concluding article will look at the final few years of his work. Posted in General, Painting and tagged Girtin, painting, Turner, watercolour. Bookmark the permalink.